Acceptance to an offer of admissions to the University of Miami School of Law must be confirmed with a seat deposit of $500 which will be applied towards first-semester tuition. Deposit deadlines were outlined in the letter of acceptance. Please note that this deposit is non-refundable. Deposit instructions can be found here. Acceptance to an offer of admissions to the University of Miami School of Law must be confirmed with a seat deposit of $1,000, which will be applied towards first-semester tuition. In most cases, this deposit may be made in two $500 payments according to the deadlines found in each student’s acceptance letter. In some cases, the entire $1,000 seat deposit will be due at once (if applicable, this would be outlined in the acceptance letter). IMPORTANT INFORMATION - The CaneLink portal for paying a seat deposit will not be in operation between May 25 and 28, 2019. We urge you to establish your CaneLink account and submit your deposit before this time. Remember, that it takes 24 hrs. for CaneLink to recognize your account and give you clearance to the online paying portal – please plan accordingly. Each student’s deposit deadlines* were indicated in his or her acceptance letter, and may also be found in his or her LSAC’s ASO account. Note that if there is an outstanding balance from a previous term at the University of Miami, all deposit funds will go towards payment of the outstanding balance. In such cases, there may not be a refund. Deposit instructions can be found here. Acceptance to an offer of admissions to the University of Miami School of Law must be confirmed with a seat deposit of $1,000 which will be applied towards first-semester tuition. Please note that only $300 of this deposit is refundable if requested at least 10 business days before the start of the entering semester. Deposit deadlines were outlined on in the letter of acceptance. Acceptance to an offer of admissions to the University of Miami School of Law must be confirmed with a seat deposit of $500 which will be applied towards first-semester tuition. Deposit deadlines were outlined in the letter of acceptance. Please note that this deposit is non-refundable. Deposit instructions can be found below. Seat deposit payments should be made online through the University Student Portal, CaneLink, https://canelink.miami.edu or by mailing a check made payable to the University of Miami. Please follow these instructions to access CaneLink. For students who have never used CaneLink, a CaneID and temporary password are necessary to log on. These will be sent by email along with login instructions. For those students who already have a CaneID, please use your existing CaneID and password to log on to CaneLink. After logging on to CaneLink, follow the instructions below to submit a seat deposit. Go to CaneLink, https://canelink.miami.edu and log on to CaneLink using your CaneID and password. Please allow at least one business day for your access to CaneLink to be granted, once you receive your CaneID and password information. Scroll to the bottom of the CaneLink page to the “Admissions” section and in the “My Application” box, click on “Accept Admissions/Pay Deposit”. On the following screen click “Accept Admissions/Pay Deposit” again. Follow the steps to pay your first, second or full deposit. If you need assistance contact the University of Miami IT Service Desk at 305-284-6565, option 2. *If a seat deposit check is received in the office after the deadline, it will be accepted on a space available basis only if it was postmarked at least seven days prior to your due date (when using regular or express US mail) or three days prior to your due date (when using UPS, FedEx or other courier). Miami Law does not accept deposits which do not meet the above requirements. It is the School's policy to cancel the acceptance of an applicant who does not make the tuition deposit payment by the designated dates. Do you want to live in a laid back environment or in a fast-paced urban setting? Are you willing to commute to the law school or are you looking to live less than a mile away? To help you understand the variety of housing options and neighborhoods, we have put together a video with testimonials about living in Coconut Grove, Coral Gables, South Miami, Brickell and Dadeland. Watch video. 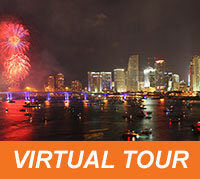 Take a tour of campus and the South Florida area.